Perfect gift ideas for the budding musician in the family. Each of these books is a cordial and clear introduction to these five instruments. There's no need to be able to read Standard Music Notation (the dots and the bars and the beams), and really no reason for a beginner to be concerned about such things. Simple neck diagrams are enough to get started. Learning music is like learning language: You want to hear it and speak it for a while before you read it and write it. The Christmas books all start with the simplest chords on their respective instruments, with chord diagrams showing the locations of your fingers and the lyrics to songs you already know. And there are several versions of each carol, a plain one to start you out followed by a slightly more challenging one. Useful Guitar Chords is just that, more or less. 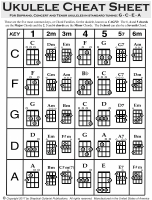 First there is an explanation and listing of the most important Major, Minor and Seventh chords that live inside the most important Chord Families, or keys, for the guitar (CAGED). There are 3 pages of chords grouped by chord letter name (A, B, C, etc.) that are the easiest and/or prettiest to be found in Open Position. (Barre chords will get their turn later.) You’ll find as many as four alternate ways to finger the same chord shape, chords with subtle distinctions that can substitute for each other, and some exotically-named and seemingly complex chords that are actually fairly easy to finger and fun to play around with. Ukulele Jump Start and Baritone Ukulele Jump Start have similar layouts to each other. They both start off with a few comments on tuning and strumming, then delve into some sample chord progressions for the single most important Chord Family, or key, for each instrument, which is C for the uke and G for the bari-uke. 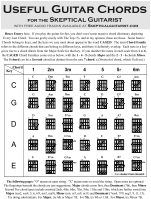 Then comes a chart that lists the most important Major, Minor and Seventh chords for the five main Chord Families as well as the popular “Rhythm Changes” for those keys. There is a discussion of how you can bring to heel the Great and Powerful Circle of Fifths and bend it to your playing advantage; two ways to use a capo (changing chord shapes to keep the same key, and changing keys while keeping the same chord shape); and a bit of fingerpicking. Finally, the back page reveals a way to play just about any chord you’ll ever run into on any piece of sheet music. Just about. 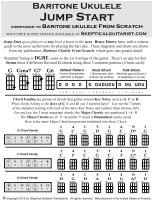 Ukulele Cheat Sheet is a stripped down version of Ukulele Jump Start, a succinct chord chart that includes larger diagrams of the easiest fingerings of the most popular and widely used chords. Laminated and with a 3-hole punch, it’s a quick and dirty reference amid the haze of a strumalong session. The front side shows the most common chords grouped into the most common keys, illustrating the overlap from key to key and acknowledging the different roles of chords within keys. On the back, you’ll find a chord dictionary of the Major, Seventh and Minor chords for the main chord types (C, G, F, etc.) plus some of the more interesting and useful variations. 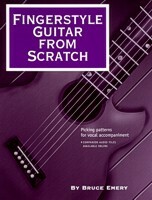 Basic guitar technique is the order of the day throughout this series. In Guitar From Scratch, there is a smattering of theory here and there, but first things first. This is where you’ll learn to finger the most common simple chords and to switch back and forth between them in a timely fashion. 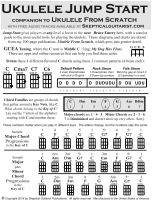 Chords are the focus: Major, Minor and Seventh chords, Anchor chords, Jazz chords, Power chords and Barre chords. Along the way, you'll see which chords group together in different keys and how to strum and fingerpick these chords using examples from popular music. 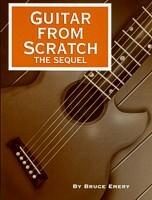 In The Sequel, we’ll look at some guitar vernacular (or common speech), work our way toward incorporating single-note playing into chord playing and then examine techniques for playing single note lines and melodies by themselves, touching on Major Scales and improvising on Pentatonic Scales. Then we’ll devote some time to learning to read Standard Music Notation for the guitar. It is the universal language of music and even guitarists can benefit from identifying and tracking down notes from the Musical Alphabet on the fretboard. Besides, you won’t find a more painless approach than the one I’ve got worked out. The Streamlined Edition covers all the material (except for reading music) in the first two books, only in a more succinct fashion. 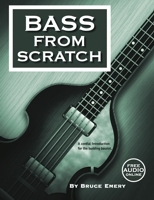 There is much less verbiage, making this book more densely packed with information, and might be preferred by the beginner who already has some command of the instrument. Fingerstyle Guitar From Scratch starts with the most basic tools and concepts and works up to full fingerstyle accompaniment parts for some popular songs. The first part gets you playing arpeggios (broken chords) and emphasizes how to change from chord to chord in the smoothest possible way. The second part introduces specialized arpeggios known as Travis-Style picking patterns. Again, these are techniques that are designed to accompany the voice or another instrument, not chord-melody arrangements, which incorporate the melodies into the chords. There is not a guitar student on earth who doesn’t want to learn some blues. 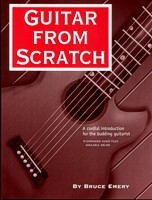 Blues Guitar From Scratch starts you off with easy licks you can play whether you want to sing or not, using the formats of the Twelve Bar Blues, the Blues Shuffle and the Guitar Boogie. After practicing the most important principles down the neck, we go on a tour of the fretboard in search of the best pockets of notes for improvising. And you can also try your hand at playing slide guitar. Travis-Style Guitar From Scratch shows you a fingerstyle technique where you play a melody line over an independent, alternating bassline. As I say above, I’ve devoted the second half of Fingerstyle Guitar From Scratch to teaching the simpler form of Travis-Picking, vocal accompaniment, but this is chord-melody playing, where you learn to incorporate the melody into the chord progression to create instrumental versions of songs. Think Merle Travis, Chet Atkins, Leo Kottke, John Fahey and Mississippi John Hurt, to name a few of the many practitioners. Experienced players may find some challenges toward the end. 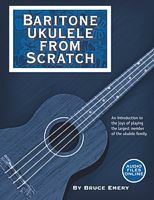 The first four books are designed for players of the soprano, concert and tenor ukulele. 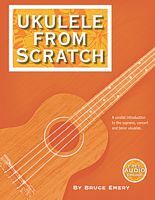 Ukulele From Scratch is intended for players who have been through all the ukulele songbooks and now want to progress to the level of understanding the bigger picture of Musicality on the instrument. Learn the language of the instrument and the whys and the wherefores. 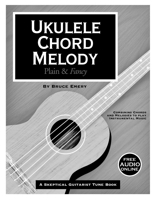 Ukulele Chord Melody: Plain and Fancy teaches you how to add the melody of a tune to the underlying chord structure in order to play instrumental versions of 17 well known pieces, arranged at two levels of complexity. 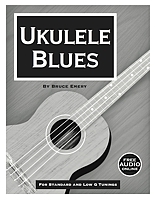 Ukulele Blues takes you from strumming chords according to the Twelve Bar Blues progression, through the Blues Shuffle and Boogie-Woogie, into the realm of improvising blues lead around the neck with the Pentatonic Scale. 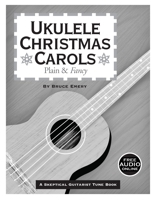 Ukulele Christmas Carols is just that, with vocal and instrumental arrangements of traditional carols presented in different keys at different levels of complexity. The baritone ukulele is a larger instrument, tuned more like a guitar, that certainly stands on its own, but can also set the stage for taking guitar lessons. This was my own experience. Baritone Ukulele From Scratch and Baritone Ukulele Christmas Carols are the baritone counterparts to the regular ukulele books described above. 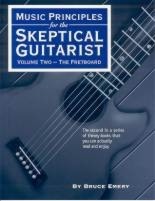 As a guitar teacher here in Raleigh, NC, I had spent a fair amount of time searching for a comprehensive, easy-to-read, user-friendly treatise on music theory written specifically for the guitar. Failing that, I wrote my own. I have tried to design a series on guitar music theory that is as much of a page-turner as possible, given the technical nature of the subject matter, using a narrative, story-telling approach. You'll find a variety of examples, exercises and worksheets to reinforce the concepts. Volume One: The Big Picture lays the groundwork: scales, chords and the Great and Powerful Circle of Fifths. Meet the CAGED System: The 5 most important chords, as well as the 5 most important keys, on the guitar. Volume Two: The Fretboard places these scales and chords all around the neck, in the form of movable CAGED shapes, and shows you how to construct fancy Chord Qualities all by yourself. 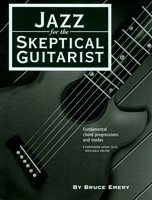 Jazz for the Skeptical Guitarist goes on to explain the most important jazz chord progressions and gives you a handle on how to start improvising your own solos. The books in this series are concerned with fingerstyle guitar, where the fingers are used to pluck out different sequences and groups of strings, as distinct from pickstyle guitar, which involves striking the strings with a pick. Fingerstyle Guitar From Scratch leads you through various arpeggios, or "broken chords," that can be used for vocal accompaniment, and then focuses on a specific kind of arpeggio that uses an alternating baseline in what is known as Travis-picking. 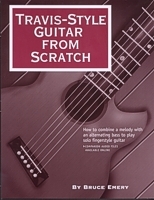 Travis-Style Guitar From Scratch builds on this information by showing you how to add a melody line to an alternating bass, using various familiar tunes at increasing levels of complexity. 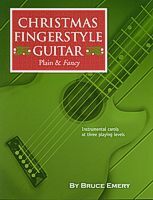 Christmas Fingerstyle Guitar presents a more classical style of combining melodies, harmonies and basslines to play traditional Christmas carols, again at different levels of increasing complexity. Once you’ve mastered the guitar (oh, you know you will! ), you can move on to the mandolin, which is just a picked fiddle with frets. Well, maybe that’s not the whole story. 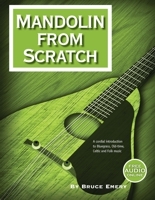 Mandolin From Scratch will start you off on the right foot. 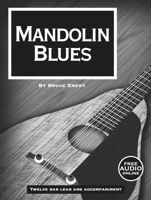 Unlike most other mando books, which focus mainly on learning to play hot bluegrass solos, this one FIRST teaches you how to play simple chords in common rhythm patterns in the most popular keys. THEN it moves on to the principles of playing lead lines using (yes) bluegrass and old-time fiddle tunes, as well as the music of the British Isles, Canada, Sweden and Slovenia. I know! You’ll even get some insight into playing melodies on top of chordal harmonies (chord melody playing). You like the blues? Mandolin Blues shows how to play rhythm patterns for the Twelve Bar Blues progression in various keys and goes on to apply the pentatonic scales to improvising lead lines over the Twelve Bar Blues in the keys of G, A and E. You like Christmas? Ho-HO! 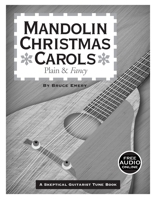 Mandolin Christmas Carols: Plain and Fancy has got you covered. There are 21 traditional, seasonal songs presented in various keys, each at two levels of difficulty. And there are condensed lyric sheets in the back to copy and pass out to the carolers. Merry Christmas! Since Christmas comes but once a year, it's hard to devote much of the holiday season to learning and practicing Christmas carols, whatever the instrument, so these books provide a range of material from easy to not-so-much. Every carol is presented at several different levels of complexity and in different keys, whether you are leading a group of carolers or playing instrumental selections in a concert, a church or at a coffee house. 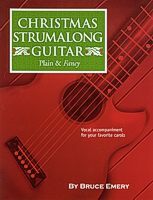 There are two guitar books, the Strumalong for caroling and the Fingerstyle for concertizing, while each of the other three books contains both vocal and instrumental arrangements under single covers. And there are lyric sheets at the end that you can copy and distribute to the singers. Merry Christmas! 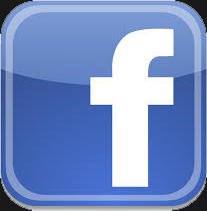 Are you a music teacher? 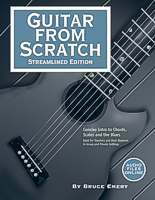 Guitar From Scratch: Streamlined Edition has been used effectively in the classroom setting as well as private guitar lessons. There is much less conversational content, making room for more material and providing a space for the teacher to insert his or her own experience, philosophy and personality. 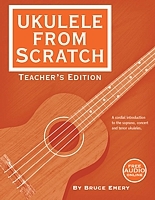 Ukulele From Scratch: Teacher's Edition contains the very same content as Ukulele From Scratch plus guidance on how to present the material, including ideas for exercises, certain points of technique to emphasize, and optional pathways for moving forward or backward in the material to suit your particular class.